These days it takes a lot more than just wrenches and screwdrivers to fix automotive problems. Modern cars and trucks are stuffed with computers and sensors that keep your car running at max efficiency. Even the most basic cars have upwards of 50 microprocessors that offer more computing power than the spacecraft that landed on the moon in the 1960s. While these electronics have made it a bit more difficult for DIY mechanics to maintain their own vehicle, they have improved safety, comfort and driveability, including in the following ways. Sensors and computers in your vehicle detect and control everything from fuel delivery and air flow to braking power and comfort accessories, such as heated seats. All of the microsensors in your vehicle are designed to send error codes to a main computer hub should something go wrong within the system. This allows an auto technician to quickly and accurately diagnose the reason something has gone awry. Electronically assisted braking, airbags, seat belt locks and more are all activated by sensors that detect a collision or chance of a collision within a millisecond. This allows for the deployment of the airbags in the event of an accident faster than the collision actually happens. Impressive, right? Many modern vehicles leaving the assembly line are outfitted with fancy infotainment systems that include navigation, radio and bluetooth. If this system goes belly up it can be quite troublesome for the driver. Yet, with superior computer diagnostics, a qualified auto technician can repair or replace the console in just a few hours. As emissions and fuel economy standards become more and more rigid, the use of computer aided emissions control systems have helped reduce automotive emissions and increase fuel efficiency. Computers allow for your vehicle's engine to run at max performance without sacrificing a drop of fuel. 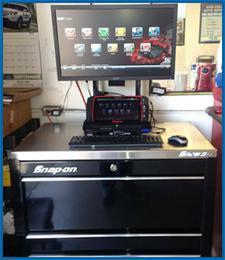 Computers play a pivotal role in the way are cars and trucks are maintained and operated. If a vehicle sensor detects an issue it will generally trigger the check engine light or some other dashboard indicator light, letting the driver know it's time to head to the shop. If your car has told you you there is a problem occuring and you need auto repair in Covina, CA, or the surrounding communities be sure to visit Hye Tech Auto. Our auto repair shop is outfitted with the latest diagnostic equipment, ensuring we can quickly and accurately fix your vehicle, no matter what you drive. To schedule superior car repair in Covina give our team a call at (626) 332-5452 today.